The Studio School & Gallery for an evening of panoramas that startle the imagination, inspire the spirit and benefit the IU Kenya partnership and the Imani Workshop. Take home a sunrise, an Acacia, a lion or a family of rhinos. Large scale Gicleès and photographs. Matted and framed in rimless glass frames. Oil Paintings and Watercolors on gallery hung canvasses ready to hang in your office or home. Custom coffee table books. With photos selected by the artist. Custom Coffee Table books you co-create with the artist. Proceeds from any items purchased on the night of the benefit will go to support the IU Kenya Partnership and the educational programs of The Studio School & Gallery. Light hors'dourve and refreshment service will begin at 5:00PM. 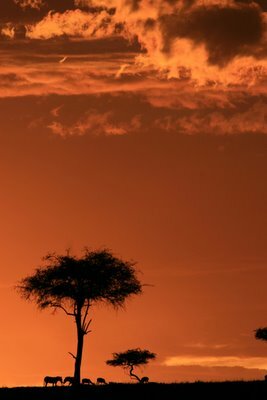 To read an essay about Hoosiers and Africa, "Who Can Help Africans Solve Their Problems?" that connects many of the events relating to Africa this spring, go to Views-PRI, the sister site of IndyBuzz (and forerunner of the electronic magazine Provocate). IndyBuzz's "First Friday" pick for January was "Carteles" [Spanish for "poster"], the Big Car opening of Sarah Zeta Zuckerman's solo exhibition, featuring works of art inspired by political and environmental brutality witnessed by the artist. 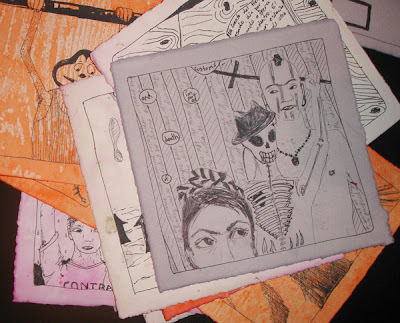 "Carteles" is an assortment of small drawings, yard signs, clothing, and paintings. The art is priced low, says Zuckerman, "in an attempt to put it out on the streets and in the hands of the masses. Given its cutting-edge, socialist, and contemporary philosophies on the nature of art and its public accessibility, Big Car Gallery was natural fit for this body of work." The catalysts for the exhibition, Zuckerman says, were public school teachers' demonstrations and police brutality that ravaged the Mexican city and state of Oaxaca. While studying indigenous art in the Oaxaca over the summer, she witnessed the government-ordered police brutality during a peaceful demonstration led by public school teachers, parents, and students protesting for higher teacher wages. As a public school teacher (teaching art at Indianapolis Public Schools' The Key Learning Community), Zuckerman had a great deal of interest and investment in the plight of the teachers. She describes how beginning June 14, 2006, police brutality rained down from helicopter and riot squads, inflaming the demonstrators, and turning a once peaceful city into a war zone. Naturally, this deeply affected millions of families throughout the entire state of Oaxaca, Mexico. 1.3 million public school children did not begin the August semester, and the majority of public school buildings stood empty, while the government headquarters in town had been seized and occupied by members of the revolting APPO party. The protest began May 22, and is still underway, gaining momentum and members from various leftist groups and agencies. Sarah Zuckerman is an active participant of almost every field of cutting-edge art and culture in Indianapolis, from teaching to dance to the spoken word ... plus she was winner of "Masterpiece in a Day." If this event sounds interesting, you should check out some of the others related to Mexico coming up. Craig Auchter talks about Mexico on February 7, and Steve Smith addresses the topic February 20. For a perspective about another marginalized group in Mexico, see "African Blood," the film about African-Mexicans at IMA February 22. Conflict and poverty elsewhere in Latin America are topics featured by two of Marian College's Franciscan Center for Global Studies speakers: an official from the World Bank talks about post-conflict Central America; and an influential priest talks about the Catholic Church's work in Latin America. This will be an interesting and perhaps even important discussion. Much more will be written about it on IndyBuzz and Provocate.org. John McCormick is professor and chair of political science at IUPUI, and a British national. He specializes on comparative politics, the EuropeanUnion, and transatlantic relations. 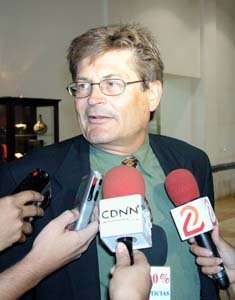 He is the author of eleven books, the most recent The European Superpower, which argues that the EU is a new kind ofglobal powerhouse that relies on soft power (economic and diplomatic pressure, encouragement rather than coercion) rather than hard power (mainlymilitary force), giving it a significant advantage over the US in the new globalized international system. John Clark believes that the US is the most powerful country today and will be into the foreseeable future. Part of this power must be hard. Meaningful solutions to the most urgent problems the world faces will require an America that is strong, self-confident, and wise. The current disasters in Iraq and elsewhere created by the Bush Administration have weakened the ability of DC to impose its will around the world (although there is no compelling reason to think this can't be reversed). More critical is to recognize that the nature of problems in the 21st century are changing in ways that diminish the importance of national (or supranational) governments in places like DC or Brussels. For RSVPs and more details about this event, contact Courtenay Weldon at courtenay@cweldon.net. More details about the substance is the debate will kick off Provocate.org. If this event sounds interesting, you should check out some others dealing with contemporary Europe. Prof. Didier Gondola discusses the explosive ethnic conflicts in France (and elsewhere in Europe). Stefan Halper looks at the "silence of the Rational Center" in US foreign policy from the Europe's eyes. In fact, many discussions this spring will examine the disoriented American "empire." January 12-14: Be the first kid on your block to see David Hoppe's "After Paul McCartney"
Most of us know David Hoppe from his excellent columns in NUVO. More than any other local writer, David tackles the really big issues of the day: local and national government performance (and malfeasance), public art and civic responsibility. More than some of his more self-revelatory NUVO colleagues, readers don't often see the intimate or personal side of Hoppe in his columns. His play "After Paul McCartney" could change that. It's a very touching picture of male friendship, often a tough subject for guys to handle. David has been showing working versions of the play, they have all been very well received. "After Paul McCartney" is a work with several incarnations, including an adaptation into a cycle of poems. You can read a section of a prose version here. I am looking forward to seeing the play. (The engagement of backstage star Rob Koharchik is a sign that it will be splendidly staged.) Tickets are $10 at the door. If you are intrigued by local theatre, you should attend the talk with veteran actor Robert Neal March 7. Christopher Edley, Jr., Dean and Professor of Law at Boalt Hall, University of California, Berkeley, will deliver a talk about "Building Success Through Unity” for the IU Indianapolis Law School's 37th Annual Dr. Martin Luther King Jr. Dinner. Prof. Edley combines academic expertise in public policy and civil rights law with an impressive record of hands-on public policy work in the White House, on Capitol Hill and on the campaign trail. A veteran of two tours of White House service and twice that many presidential campaigns, Edley has played a central role in the high-stakes world of national politics for nearly 30 years. 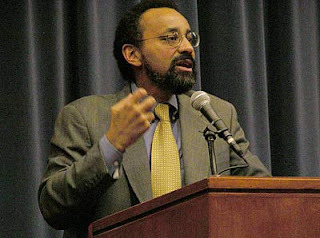 A former professor at Harvard Law School, where he taught for two decades and co-founded its Civil Rights Project, Edley became Dean of Law at Boalt in 2004. As special counsel to President Clinton, he led the White House review of affirmative action programs and helped develop Clinton’s "Mend it, don’t end it" position on affirmative action; at the Office of Management and Budget he oversaw one-quarter of the federal budget. In the Carter administration he served as assistant director of the White House domestic policy staff, where his responsibilities included welfare reform, social security and a variety of anti-poverty measures. 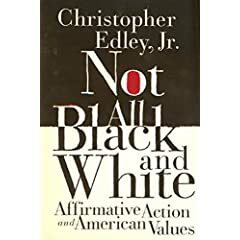 Edley has served on numerous boards and commissions including the U.S. Commission on Civil Rights, the Carter-Ford National Commission on Federal Election Reform, and the Council on Foreign Relations. The dinner is co-sponsored by Indiana Black Expo, the IUPUI Black Student Union, the IUPUI Office of Campus and Community Life and the IU School of Law-Indianapolis. Tickets are $40.00 and are available until January 7, through the IUPUI Office of Campus and Community Life, 317-274-3931. If this event sounds interesting, you should check out Edley's colleague at Boalt Hall, John Yoo, on March 2. What a contrast! A couple of other discussions of civil rights and African Americans should touch on the same themes Edley will address: journalist Tavis Smiley on February 2, and public intellectuals Henry Louis Gates and John Hope Franklin April 5. Some of the same themes will be addressed by Supreme Court Justice Ruth Bader Ginsburg on March 8. If you would rather not take your kids to hear Christopher Edley, head over to the Sharing the Dream: Dr. Martin Luther King Jr. in Indiana," an exhibit opening at IHS January 6. King had many ties to Indiana profoundly shaped the 1960s civil rights movement in the state. In the Lacy Gallery from January 6 through March 31, "Sharing the Dream" will feature documents, letters and images from the IHS collections, including rare photos of Robert Kennedy’s speech in Indianapolis where he shared the news of King’s assassination with the crowd. King’s “I Have a Dream” speech will be available as an audio component of the exhibition. Monday, January 15, from 10 a.m. to 5 p.m., in celebration of King’s birthday with special family activities, performances and more that commemorate his work. Visitors can watch a short documentary on King, children can create crafts related to the civil rights movement, participate in a scavenger hunt and enjoy music and dance performances by Asante Children’s Theatre, Kenyatta Dance Company and more. 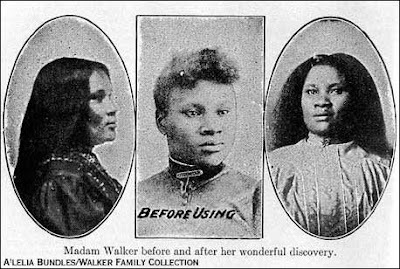 If this event sounds interesting, you should bring your family back to IHS on January 26 to explore Madame CJ Walker's "Treasured Collections" with an impersonator of Madame Walker. Justin Logan is one of the very bright young Foreign Policy Analysts that the Cato Institute seems so good at recruiting. Cato is seen as the leading libertarian think tank in the US. Its love of unfettered markets and deep suspicion of government action would lead most to think of it as conservative. But on many issues of military action and international security, Cato sounds a lot like left-leaning critics of the Bush Administration. It appears increasingly likely that the Bush administration's diplomatic approach to Iran will fail to prevent Iran from going nuclear and that the United States will have to decide whether to use military force to attempt to delay Iran's acquisition of a nuclear weapons capability. Some analysts have already been promoting air strikes against Iran, and the Bush administration has pointed out repeatedly that the military option is "on the table." This paper examines the options available to the United States in the face of a prospective final diplomatic collapse.... The United States should begin taking steps immediately to prepare for a policy of deterrence should an Iranian bomb come online in the future. As undesirable as such a situation would be, it appears less costly than striking Iran. Reservations for this special talk and dinner (at the Marten House!) should be made by calling 317-566-2036, or e-mailing cmatthewfox@gmail.com. E-mail reservations must have the subject heading "ICWA Dinner Reservations" and must contain all contact information, including name, address, telephone, and number of reservations being made. All reservations must be received by the end of the day Thursday January 11. This is also the date by which any cancelations must be received. Dinner for ICWA members is $22 per person, $24 for non-members. If you would like to attend only the talk, the cost for ICWA members is $3; for nonmembers, the talk alone is $4. At 3:00 PM on January 17th Logan will informally discuss Iran and other Middle East topics with experts and students at the Sagamore Institute. To reserve a spot, contact John Clark at john@sipr.org. If this event sounds interesting, you should check out some of the other events about the Middle East coming up this spring. As part of local Great Decisions series, Pierre Atlas will talk about the region on January 24, Prof. Nafhat Nasr will talk February 13. Logan's theme is not only exactly Iran but US policy stance toward Iran. That means some of the discussions of US power and responsibility -- the American Empire -- will be very relevant. 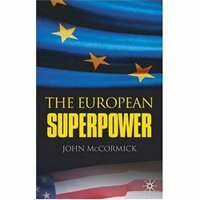 Check out the debate about the US vs Europe between John McCormick and John Clark January 30, and the talk by the critic of neo-conservative foreign policy Stefan Halper February 21.
a year of training they have to find a large sum of money before Eiko can debut. The film explores the clash of pre-war traditionalism in the pleasure quarters with the new atmosphere of individual liberty and equal rights for women in post-war Japan. The film showing is free. Make sure you view the IMA's excellent collection of Japanese art, including ceramics, lacquer ware, woodblock prints, sculpture and paintings, and one of the finest collections of Edo-period painting in the U.S. The collection also offers contemporary ceramics by Japan's leading artists. If this event sounds interesting, you should check out the equally classic Japanese film Kaidan on April 28 as part of the IMA's series of films that have inspired the Cuban artist Magdalena Maria Campos-Pons. And definitely attend the Indianapolis International Film Festival April 25 to May 4. Visit IndyBuzz's sister site "Views-PRI" for an essay that connects many of the events related to Asian economy and culture: "China, Japan, Indiana: Eastern and Midwestern Cultures Mingle." Riots in 2005 wreaked havoc in several French banlieues [French suburbs that feel more like inner city slums than US suburbs such as Carmel]. This led some black and beur [second and third generation French who roots are in North Africa and other parts of the former French Empire] civic organizations — including “les Indigènes de la République” — have attributed the anger fueling the riots to the persistence of colonial relations between France and its population of African descent, the so-called français issus de l’immigration (first- and second-generation French) as opposed to Français de souche (“native” French). Needless to say, most French pundits and scholars quickly dismissed such an explanation not on ly as flawed but dangerous as well, a cipher likely to drive a wedge into French society. Instead, these pundits have turned the table on the rioters by putting forth arguments that range from the breakdown of African families living in France, to polygamy, rap music, and more generally their unwillingness or inability to assimilate as more accurate explanations for their marginalization. 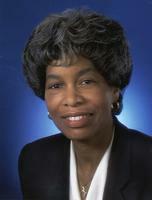 regarded professor of history at IUPUI. Born the Congo and raised in Paris, Prof. Gondola is the author of The History of the Congo. For more information, contact: Annette Hill, 317-278-1839. If this event sounds interesting, you should check out a couple of films at the IMA about the African experience elsewhere: from Brazil see "Favela Rising" February 8; from Mexico see "African Blood" February 22. For a sense of why Algerians might not be happy with the French, see the classic film Battle of Algiers March 22. Academic WorldQuest is widely played at the adult and high school levels around the country. It is a team game testing competitors' knowledge of international affairs, ge ography, history, and culture. You can find out about it here. The World Affairs Councils of America holds a national competition for high schools in DC in April. Last year the Indiana Council on World Affairs sponsored a team from Lawrence North High School ... despite it being their first exposure to the compeition, they did very well. (LNHS: More than just basketball.) This year there will be a competition at Marian College to select the representative to the DC tournament. It will be grueling, check out last year's questions. IndyBuzz has a dream of staging a WorldQuest tournament for all comers in Indianapolis next year, let's check out the competition at Marian College on January 20. 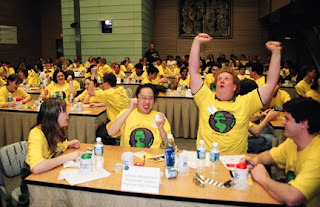 Stretch your brain with questions from last year's Academic WorldQuest. If you plan to attend, please contact Janet Jegen by email or phone (849-2691) so that there will be enough chairs and refreshments for everyone. Some day when the story is told of how Kenya survived the early 21st century, Indiana will be an important part of the story. 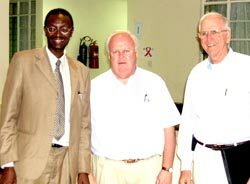 Start with the massive and still growing partnership Indiana University Medical School has formed with Moi University in Eldoret, Kenya. Add the Indianapolis Rotary Club's ambitious plans now being launched. Toss in churches such as 2nd Pr es and North United Methodist, which are setting up and running orphanages. 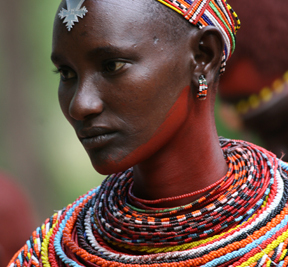 And the "volun-tourism" missions to Kenya being organized by Ambassadors for Children. It adds up. In fact, these sorts of local-to-local partnerships to solve global problems could become more significant than the US-government-to-foreign-government relations that we think of as foreign aid. The direct relations -- the "citizens diplomacy" -- established through these partnerships could be more important than the "public diplomacy" campaigns sometimes launched by the State Department. 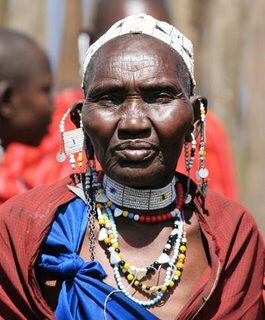 Several Hoosiers currently engaged in local-to-local relations with Kenyans will discuss their work, the problems they are addressing and the possibilities of working with Kenyans to find solutions. If this event sounds interesting, you definitely should check out the fundraiser for the IU-Moi partnership at The Studio School and Gallery February 10. Kelly Campbell of Ambassadors for Children will talk to the Indiana Council on World Affairs about South Africa on March 6, you are sure to learn more about how you can help Africans solve their problems. Where: Westin Hotel, downtown Indianapolis. Sponsored by Indiana State University. This conference is organized by Indiana State University's Networks Financial Institute, which "exists to help the financial services industry transform itself through better leadership, creative collaboration, and community-based financial literacy initiatives." They do have a stellar line-up for the day and a half conference. Why China? Exchange of ideas and information regarding the opportunities and benefits to Indiana from developing relationships and conducting business with the Chinese, especially related to capital investment and trade will be addressed. How to work with China? Specific issues such as Chinese tax law and acquisition, labor law and more will also be addressed. What are the current weaknesses and strengths in the Chinese financial system? What is the pace of reform and is it sufficient? Is the financial system impairing growth? Will the financial sector become a leading sector for rapid growth in the United States? Speaking will be James R. Barth is the Lowder Eminent Scholar in Finance at Auburn University and a Senior Finance Fellow at the Milken Institute; and Morris Goldstein, the Dennis Weatherstone Senior Fellow at the Institute for International Economics. The conference costs $75. For information and a registration form, contact Linda Beckwith at 317-536-0281 or 800-603-7113; or Register Online Here. The registration deadline is 17 January. If this event sounds interesting, you should check out events at the World Trade Club such as its review of US trade policy February 20. You can get a very different perspective on culture with a Chinese music and art event at UIndy Valentine's Day. Although the U.S. will remain closely engaged in Iraq during the next year, other factors have emerged to challenge stability in the region. Iran's nuclear program, the outcome of the conflict in Lebanon, and Israeli-Palestinian negotiations will all play a key role. How will these issues shape the Middle East? A deceptively simple question, and no one is better at clarifying the issues' complexity and ambiguity than Pierre Atlas of Marian College. Want a taste of the Pierre Atlas experience? Check out this GeoPol video. Pierre is a professor of political science at Marian College, columnist for the Indianapolis Star, pundit for Real Clear Politics, founder and director of the Franciscan Center for Global Studies, associate fellow with the Sagamore Institute, etc. Sponsored by the Bob Calhoun Memorial Great Decisions Series. If this event sounds interesting, you should check out the ICWA's Great Decisions discussion of the Middle East on February 13 with Prof. Nafhat Nasr, who is sure to present a very different perspective on the region. For an important contrast, John Clark will give a couple of Great Decisions talks about Central Asia on March 7 and March 20. Definitely see the film "Iraq in Fragments" February 23 to March 1. Much of early video art was understood as “media criticism” because it turned the major weapon of mass media--television--against itself. Rosanne Altstatt, former Director of the Edith Russ Site for Media Art in Oldenburg Germany and now a visiting scholar at Purdue University, presents screenings and discussion about historical and recently minted classics by artists such as Nam June Paik, Dara Birnbaum, and Ant Farm. This program, on the opening night of the RothStauffenberg exhibition, will be followed by an informal gallery walk-through led by Altstatt and Rebecca Uchill, IMA assistant curator of contemporary art. RothStauffenberg is an artists’ team that consists of Christopher Roth and Franz Stauffenberg, both of whom live and work in Berlin, Germany. The duo work on the cusp of media, video, and installation art, often combining elements from all media to create highly experiential environments. For their exhibition at IMA, the artists of RothStauffenberg will display a range of their work, and adapt some elements of existing pieces in new installations. 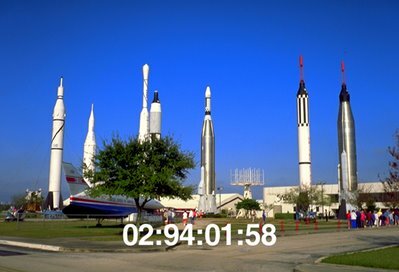 The project will include a multi-part projection of footage taken from the artists’ Hollywood film archive, as well as wallpaper decorated with timecode, pointing to the way that directors and editors use numbers to organize film, independently of a narrative structure. If this event sounds interesting, you should check out the RothStauffenberg exhibition, which will be at IMA January 25 to July 29 in the Off the Wall Gallery and Carmen & Mark Holeman Video Gallery. You can attend the crash courses on Pop Art at the IMA February 8, and at the Eiteljorg February 15. See the exhibition of Ed Paschke at Herron School March 9, too. Cost to attend is $20; $16 IHS Members; $12 students under 18. Registration is required by February 19. To register call (317) 232-1882. If this event sounds interesting, you should check out some of the other discussions of African Americans in Hoosier History such as April 13 conference on African religions and the Great Migration. Another view of women in history could be sought in a talk about the impact of child-rearing literature February 16. Harold Holzer, foremost Lincoln scholar, discusses the Lincoln Collection at the Indiana Historical Society ... plusfree films! History Makers: IHS Distinguished Speakers Series featuring Harold Holzer, author or editor of several dozen books about Abraham Lincoln. Holzer will discuss "Abraham Lincoln Portrayed in the Collections of the Indiana Historical Society," his new book from the IHS Press. Following the presentation, Holzer will sign copies of his book at a cookies-and-punch reception. Guests will have the opportunity to watch the Society's new Civil War film "Well Done, Indiana" and the documentary "Young Lincoln," both of which were produced by Emmy Award-winner Todd Gould from WFYI television. It's free but come early, seating available on a first-come, first-served basis. While you have your Lincoln thing on, you should head to the Indianapolis Museum of Art to see a copy of the 13th Amendment to the U.S. Constitution, signed by Abraham Lincoln, 33 U.S. senators and 114 U.S. representatives. 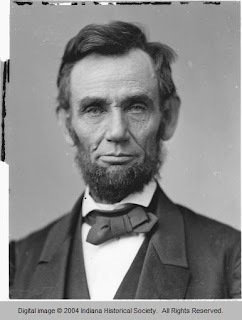 The 13th Amendment was passed by the House of Representatives on February 1, 1865, ending slavery an d involuntary servitude except as punishment for criminals. After passage, a few souvenir copies of the amendment were circulated. One of these copies belonged to abolitionist Charles Sumner, who presented it to James Wormley, an employee of his household. This copy of the 13th Amendment was passed down in the Wormley family before its sale to J. K. Lilly Jr. Also on view: a copy of the Emancipation Proclamation, signed by Lincoln in 1863. The Charles Sumner–James Wormley Copy of the 13th Amendment & The Emancipation Proclamation will be displayed January 15 through February 25 all day at the IMA's Lilly House and is Free. Trust seems like a simple concept, but understanding the ethics of trust and cultivating it in corporate settings can be difficult. What is trust and how does it express itself in the workplace and in corporate boardrooms? Does the place of trust in religious communities offer any insight for the business world? Discussing this topic will be Katherine Tyler Scott is a consultant on corporate leadership, labor relations and conflict management. She is managing partner of Ki ThoughtBridge, an Indianapolis-based consulting firm that focuses on leadership development, change management, conflict resolution, and negotiation. 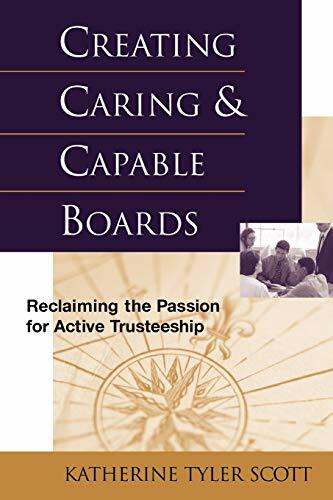 She is founder and former president of Trustee Leadership Development, and author of Creating Caring and Capable Boards: Reclaiming the Passion for Active Trusteeship. Ms. Scott is an active laywoman in the Episcopal Church and a member of that denomination’s Special Commission on the Episcopal Church and the Anglican Communion. Responding to her talk will be the Rev. Kent Millard, senior pastor at St. Luke’s United Methodist Church in Indianapolis, congregation of diverse lay-driven ministries and programs. This discussion is part of Butler University Seminar on Religion and World Civilization, and is organized by the Center for Faith and Vocation. If this event sounds interesting, you should check out the Center's talk about whether capitalism is in the public good on February 27. YOu also might want to attend a discussion of how Swedes are trying to integrate work and family life on March 9. How much are human practices contributing to substantial and irreversible changes to the environment? 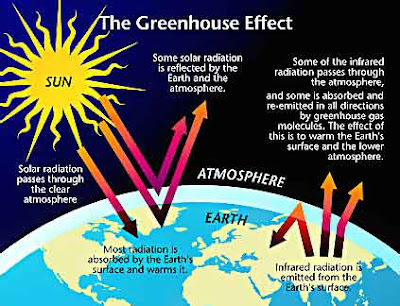 What effect are changes to the climate having in different areas of the planet? What response can the international community adopt to lessen the impact of dramatic climate change? If this event sounds interesting, you should check out All Gore when he comes to town in April, or just get a copy of "Inconvenient Truth." Even better will be to join in other discussions of climate change and the environment. As part of the ICWA's Great Decisions series, you can hear IUPUI climatologist Gabriel Filippelli February 6. Stanford scientist Stephen Schneider discusses "Can we measure, let alone solve, global warming" April 18. Award-winning author Alice Kaplan will discuss writers and responsibility, engagement and justice. 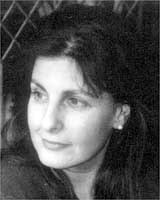 Alice Kaplan comes to Butler University as part of the Vivian S. Delbrook Writers Studio. 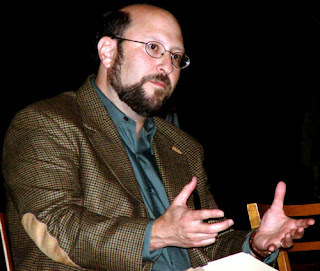 Kaplan is a professor of romance studies, literature and history at Duke University. Her books include The Collaborator: The Trial and Execution of Robert Brasillach, which won The Los Angeles Times Book Prize in History. Most Americans don't know about Robert Brasillach, a writer who was executed after World War II for collaborating with the fascists. 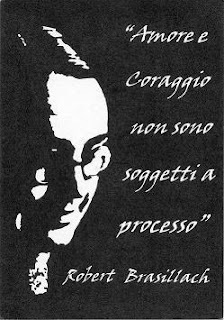 Executed for intellectual rather than political crimes, for not for what he did but for what he wrote. Kaplan calls him "the James Dean of French Fascism," although presumably not because of the way he looked. What makes Kaplan's work on Brasillach as well as other aspects of French literary fascism is not (only) that her father was a prosecutor at the Nuremberg Trials after World War II. 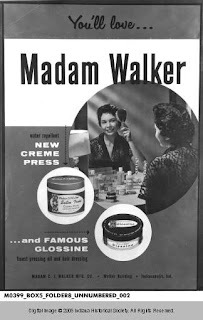 It is that her time at Yale coincided with the height of fashionability of Yale French professor Paul de Man. After de Man's death in 1983, it was revealed that he had himself written extensively for anti-semitic and pro-fascist newspapers in Belgium during the war. This should be a very interesting talk. For interviews with Prof. Kaplan, go here and here. The Collaborator is a nicely written piece of history, you can read a chapter here. Here's an article that places Prof. Kaplan's work in a bigger context. If this event sounds interesting, you should check out some other events that are curiously connected. 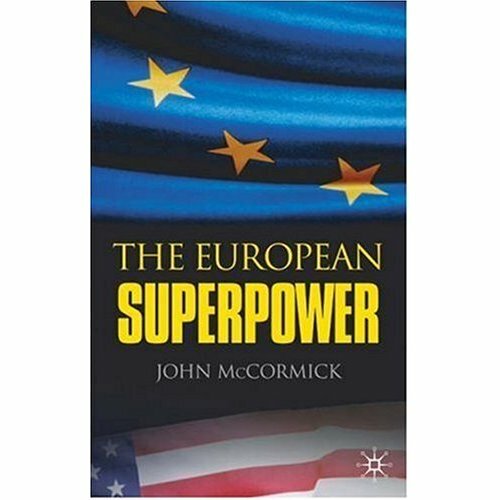 Kaplan could help more sense of Europe, the emerging superpower in John McCormick's vision of the world (January 30). She also could help illuminate the Great Decisions groups' questions of war crimes and international justice to be discussed February 28 and March 13. 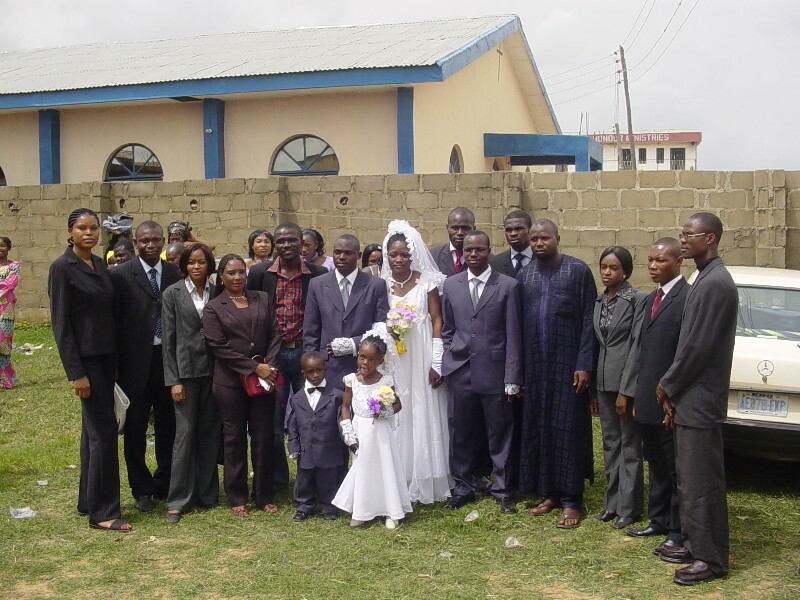 Participants will learn about Chinese and Nigerian wedding customs in this final installment of IMA’s World Weddings Series, in which representatives from local cultural organizations demonstrate and discuss their wedding customs. After the program, participants are invited to visit the exhibition "I Do" to see examples of wedding attire from these traditions. It's free! If this event sounds interesting, you should check out see the manifestation of traditional Chinese art and culture at UIndy on Valentine's Day. Visit "Views-PRI" for an essay that connects many of the events related to Asian economy and culture: "China, Japan, Indiana: Eastern and Midwestern Cultures Mingle." In this iteration of the IU School of Liberal Arts Sabbatical Speaker Series, “Return Migration to Post-Soviet Estonia and Latvia” IUPUI Professor of Sociology Ain Haas examines the experiences of first-, second-, and third-generation exiles/emigrants of Estonian and Latvian heritage (primarily political refugees and their descendants), who returned to their ancestral lands when the Soviet regime collapsed. The talk is based on personal interviews with some 130 returnees covered their reasons for moving, adjustment to life in the Baltic countries, and comparisons with their old life in the West. It is a topic close to Ain's heart since he himself is of Estonian descent. It's topic I find fascinating ever since working in the three Bal tic countries in the early 1990s. The 2nd and 3rd generation Latvians and Estonians resembled Jews emigrating to Israel in the 1940s more than émigrés returning to the other newly democratic East European countries. They had been born in the US or Canada or Sweden, had attended language classes every weekend, and Latvian camp in Michigan the summer (I don't know if the Estonians had a similar summar camp), and the annual song festivals around the world. They had been inculcated form the time they could talk with a mission: the Soviets are wiping out our people at home, you are the sole hope of preserving our language and culture. So when Latvia and Estonia became independent, it was almost instinctual for a lot of these kids to take their freshly minted BAs from Indiana University to Riga or Tallinn, and to offer generously to run the countries. The Latvians and Estoians who had remained in the homeland during the Soviet occupation received these kids -- filled with naive idealism I think more than opportunism -- with mixed feelings. (And the Russians who'd moved to the Baltic republics during the half century of incorporation in the USSR wanted nothing to do with these often nationalistic outsiders.) Fascinating to watch, very different from the situation at the same time in Lithuania. 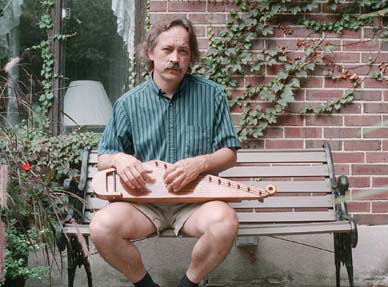 Ain Haas is also a member of my favorite local band, "The Hedgehogs," which plays heartrendingly beautiful music from the Baltic countries. If this event sounds interesting, you should check out others examining crossing of borders. Compare the experiences of returning Balts to the situation of global migration patterns on February 14 and February 27. 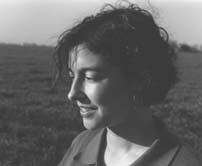 María Meléndez has published several volumes of poetry, including How Long She'll Last in This World. 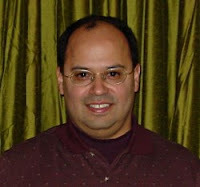 Francisco Aragón teaches and directs Letras Latinas, the literary unit at the Institute for Latino Studies at the University of Notre Dame. His most recent book of poems is "Puerta del Sol." Their appearance is co-sponsored by the Consulate of Mexico and the Indianapolis-Marion County Public Library. If this event sounds interesting, you should check out the poetry reading by Martín Espada April 27. Compare the poetry inspired in part by being Hispanic in the US with the Affrilachian Poets' poetry inspired by being African American in Appalachia. Dr. Ulrich Lächler, the World Bank's lead economist for Latin America and the Caribbean Region, will speak at Marian College as part of the Franciscan Center for Global Studies Global Speaker series. Dr. Lächler is a German national, who grew up in Venezuela and now resides in Miami. He has been with the World Bank for 20 years, working mostly on Latin America, with particular attention to Central America. Before joining the World Bank, Ulrich Lächler headed a research team at the Kiel Institute of Economics in Kiel, West Germany. Before that, he was an assistant professor in economics at Columbia University (New York City) and at the University of Maryland at College Park. He holds a Ph.D. in Economics from Columbia University (where his doctoral thesis advisor was this year’s Nobel Prize winner, Professor Edmund Phelps). For information about how the World Bank deals with post-conflict situations, check this out. If this event sounds interesting, you should check out Marian's talk about the Catholic Church in Latin America on February 13. Prof. Gabriel Filippelli--Chair Department of Earth Sciences at IUPUI and Associate Director of Center For Environmental Health at Indiana University -- discusses global climate change for the Great Decisions Series of the Indiana Council on World Affairs. These and other questions will be addressed by Prof. Gabriel Filippelli of IUPUI. Part of the reason why the public and policymakers seem confused about the topic of "global warming" (perhaps more precise would be to call the topic "massive human induced climate change") is that the science is hard. It isn't just that the math underlying the models is beyond our brains, there is also a matter of understanding the nature of the scientific method and the role of doubt. Filippelli should be a valuable guide, a real live honest to goodness climate scientist who works hard to clarify issues for ordinary citizens. Here's how he describes his research agenda. Filippelli was featured in a WISH-TV feature about global climate change. “When greenhouse gases like carbon dioxide and methane go up in our atmosphere, because of physics, the atmosphere and the planet simply have to warm,” said Dr. Gabriel Filippelli, IUPUI. Proponents say they have proof. “We can prove this by doing this in a lab experiment in a beaker. You add more of these gases in, the beaker is going to be hotter with the same amount of incident light,” said Filippelli. Prof. Filippelli will surely help connect this global issue to local concerns. We get a taste of this in a news article from last year. If this event sounds interesting, you should check out the Church of the Saviour's Great Decision discussion of global climate change January 31. And hear a Stanford scientist ask whether we can even measure global climate change on April 18. That makes science sem pretty fuzzy ... so let's listen to the leading authority on the fuzziest of warped and bizarre science on March 7. The results of Mexico's presidential election were nearly too close to call: how will this result affect the new Mexican administration's policies? Can Felipe Calderón successfully reform Mexico's policies on energy, trade and border security and strengthen relations with the United States? Prof. Craig Auchter is the chair of the department of political science at Butler University, and is one of the area's leading experts on democracy and social change in Latin America. Sponsored by the Bob Calhoun Memorial Great Decisions Series. If this event sounds interesting, you should check out the ICWA's Great Decisions discussion of Mexico on February 20. And visit the exhibit of art inspired by conflicts in Oaxaca at Big Car through the end of January. 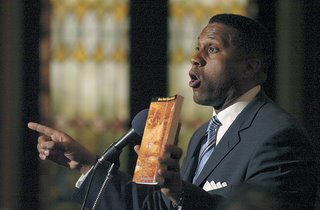 In 2004, Texas Southern University honored Smiley with the opening of The Tavis Smiley School of Communications and The Tavis Smiley Center for Professional Media Studies, making him the youngest African American to ever have a professional school and center named after him on a college or university campus. Smiley cemented his commitment to TSU with a $1million gift to the Center. 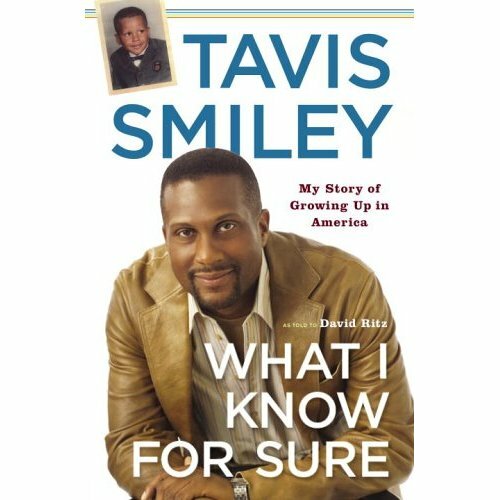 The mission of his nonprofit organization–Tavis Smiley Foundation–is to enlighten, encourage and empower Black youth. 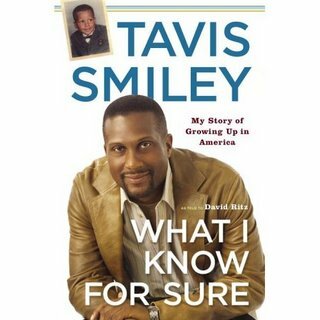 Tavis Smiley Presents, a subsidiary of The Smiley Group, Inc., brings ideas and people together through symposiums, seminars, forums and town hall meetings. 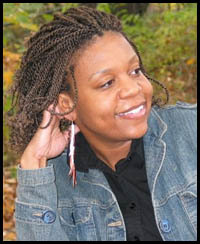 Smiley is author of many books, including the newly published What I Know for Sure: My Story of Growing Up in America. If this event sounds interesting, you should check out some of the other African American public intellectuals and policymakers coming to Indianapolis in the spring: Christopher Edley January 14, Henry Louis Gates and John Hope Franklin April 5, and Colin Powell March 12. Tavis Smiley's programs provide an alternative to the simplistic and divisive DC media culture dissected by Stefan Halper February 21. The Affrilachian Poets are an electrifying ensemble of African-American writers who challenge notions of an all-white Appalachian culture while drawing on traditions of the Harlem Renaissance, the Black Arts Movement, and experiences of the African diaspora. They celebrate their heritage and rural roots while addressing themes of racism and Black identity. This reading will feature performances by Ricardo Nazario Colon, Kelly Norman Ellis, Asha French, Parneshia Jones, Frank X. Walker, and Mitchell Douglas, a new assistant professor in creative writing at IUPUI. 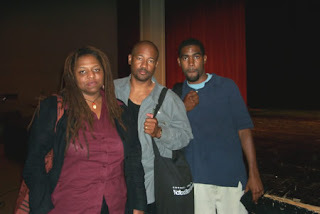 The Affrilachian Poets were the subject of the 2001 PBS documentary Coal Black Voices. If this event sounds interesting, you should check out some other examples of the cultural cross-fertilization of Africans in the Americas. You can groove to Sancocho's explorations of African music in Latin America February 9 at IMA, or hear about the centuries of complex relations between Indigenous and African Americans at the Eiteljorg February 24. February 8: Go to IMA to watch the Brazilian film "Favela Rising"
IMA's fascinating "Africa in the Americas" film series presents "Favel Rising"
"Favela Rising" documents a man, a movement, a city divided and a favela – a Brazilian squatter settlement – united. Haunted by the murders of his family and many of his friends, Anderson Sá is a former drug trafficker who turns social revolutionary in Rio de Janeiro’s most feared slum. Through hip-hop music, the rhythms of the street and Afro-Brazilian dance, he rallies his community to counteract the violent oppression enforced by teenage drug armies and sustained by corrupt police. At the dawn of liberation, just as collective mobility is overcoming all odds and Anderson’s grassroots Afro-reggae movement is at the height of its success, a tragic accident threatens to silence the movement forever. 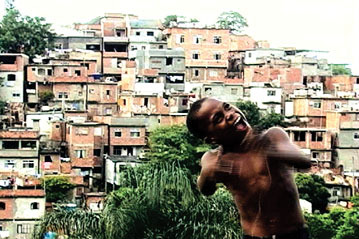 Favela Rising has received thirteen national and international film festival awards. If this event sounds interesting, you should check out some of the other films the IMA is showing about African culture in the Americas: RIZE on February 15 looks at a life-affirming adaptation of African dance to the hard streets of South LA; "African Blood" about African-Mexicans shows February 22; and you will very much want to attend the Indianapolis International Film Festival April 25 to May 4.